Today, read about Rockefeller Center on of the most significant destinations in New York City. Here you will find out some new facts about this place you didn’t know earlier. The Rockefeller Group is a private company based in New York City. The company is involved in estate operations in the United States. The Rockefeller Group began their development of building Rockefeller Cener. After building this huge complex from 1931 to 1939, the company developed several towers in surprisingly short terms, from the late 1940s into the 1950s and 1960s. It entered into a partnership with Time Inc. and constructed a 48-story building for the company that opened in 1959; this spearheaded the expansion of the Center to the west of 6th Avenue, Avenue of the Americas. By the early 1970s, it added four towers to Rockefeller Center, increasing the size of the original complex almost twice. Today, The Rockefeller Group occupies 720,000 m2 of office space. The eastern and original part of the Center is now owned by Tishman Speyer and Lester Crown. The Rockefeller Center in Midtown Manhattan is an Art Deco New York City landmark. Featuring 19 commercial buildings and occupying 89,000 m2 in New York, it is one of the most popular attractions in the city. A center is a spot, to numerous events and celebrations that are provided all over the year. 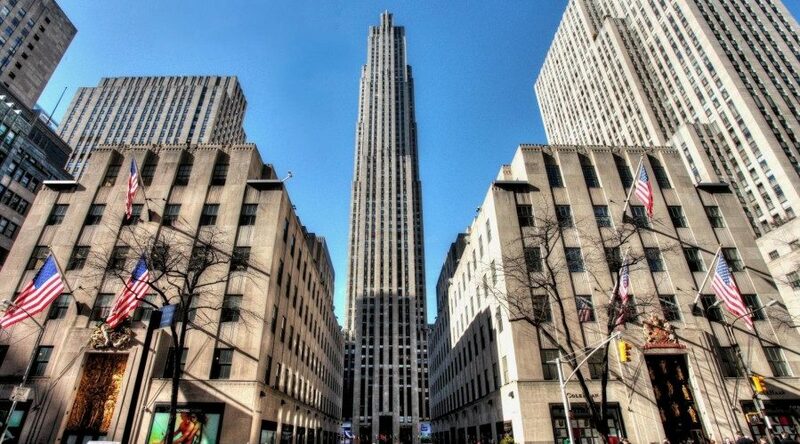 It was built in 1939 and was the creation of famous New York businessman, John D. Rockefeller. In the depths of the Great Depression, Rockefeller Center – still the largest private building enterprise ever undertaken in the United States – began rising over midtown. The project gave employment to almost 4,000 New Yorkers. The original fourteen structures remain supreme examples of the heroic slab skyscraper and the Center as a whole embodies the modernist ideal of multiple use in urban design. Rockefeller Jr. envisioned a large, ambitious commercial development for the young network-broadcasting industry. RCA, RKO, and NBC would be primary tenants. The complex was originally named “the Radio City” and was intended to be a planned modern community. The original fourteen buildings were designed by three of the era’s foremost architectural firms: Hood & Fouilhoux; Corbett, Harrison, & MacMurray; and Reinhard & Hofmeister. Property contains approximately 6,443,537 square feet of usable space. In the first few decades of the 19th Century the site of Rockefeller Center was occupied by the Elgin Botanic Garden. In 1969 this complex was the first recipient of the American Institute of Architects’ prestigious Twenty-Five Year Award given to buildings whose design has stood the test of time for at least 25 years.